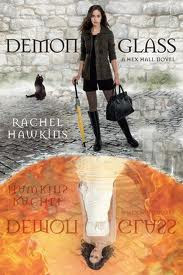 Demonglass was written by Rachel Hawkins. It is the book 2 of the Hex Hall series. Turns out, Sophie’s a demon, one of only two in the world—the other being her father. What’s worse, she has powers that threaten the lives of everyone she loves. Which is precisely why Sophie decides she must go to London for the Removal, a risky procedure that will either destroy her powers forever — or kill her. But once Sophie arrives she makes a shocking discovery. Her new housemates? They’re demons too. Meaning someone is raising them in secret with creepy plans to use their powers, and probably not for good. Meanwhile, The Eye is set on hunting Sophie down, and they’re using Acher to do it. But it’s not like she has feelings for him anymore. Does she? Witches, demons, etc. People who love them. People who hate them. People who are them. People who aren't sure what they are. Add in the general teenage angst. Still.... I'm looking forward to see how the story progresses when book 3 is released in March 2012.